Thank you so much for this! I always enjoy reading what the directors have to say about the guys. He used to have this cuteness about him in the past, but 'cool' has really become a fitting term for him now. Spot on! In recent years, we've seen Aiba grow and take a manlier presence - and I think Aiba Manabu has contributed much in shaping Aiba the way he is right now. 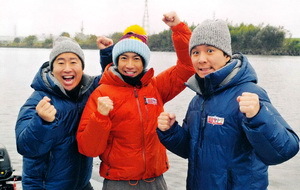 Aiba Manabu is my favorite solo program too. There's just something about Aiba's interactions with different people and of course, Aiba's zest and curiosity that's always refreshing to see. Aiba Manabu has become this unique space for Aiba to strike a balance between being an adult who takes initiative, and being a kid who enjoys the little discoveries they make along the way.